This dish works well with leftover rice. 1) Cook the brown rice according to package directions. It works well if you make it a day ahead and refrigerate. Leftover rice is great in this dish. 2) Heat ½ tbsp of oil in wok on medium-high heat. Add egg and fry till done. Remove. 3) Add ½ tbsp. oil and 1 tbsp. soy sauce to wok. Add onion and stir fry a few minutes. Then add remaining oil. Add broccoli, cabbage, carrot, peas, edamame and your choice of tofu, veg chicken or veg beef or cashews or peanuts. Stir fry all of this together a few minutes until broccoli is fork tender. 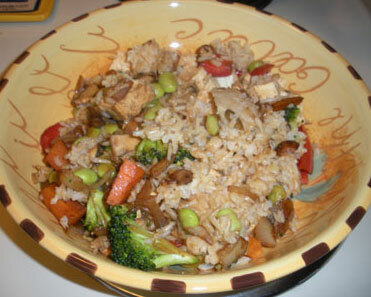 4) Add rice and remaining soy sauce and stir with vegetables. Add egg and stir everything together. Serve.